After being back in London for about a fortnight, I am slightly jealous of my two-weeks-ago self who was wandering about Hong Kong in this dress feeling the heat and humidity. Actually on second thoughts maybe I'm not that jealous. It would be nice for it to get to around 25 degrees C though, right? These photos were taken in Harbour City just outside Hanbing. I bought this dress last Summer but didn't really have a chance to wear it until I got to Hong Kong. I fell in love with the tropical print and the little cut out detail. I'm not a huge fan of the long zip at the back and wish it stopped before it got to the skirt but that's only a minor detail. I paired it with sandals and a simple necklace because less is more when it's boiling hot. Yeah the weather in HK right now isn't my favourite. Too sticky and humid! But you know what, I'd definitely be back there in a heart beat regardless. 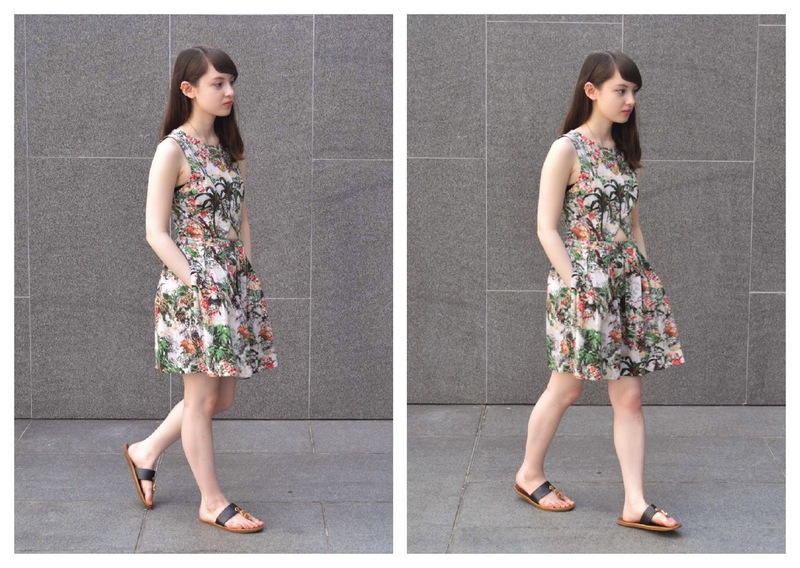 You look lovely - that dress is the prettiest print!